Hey there folks. Hope you all are doing well. We seem to be on the mend, but it has been a tough couple of weeks. The not so great part about it no longer being 95 degrees outside is that everyone gets sick. Lance got over his Pink Eye from last week pretty quickly, but then got sick again this weekend. 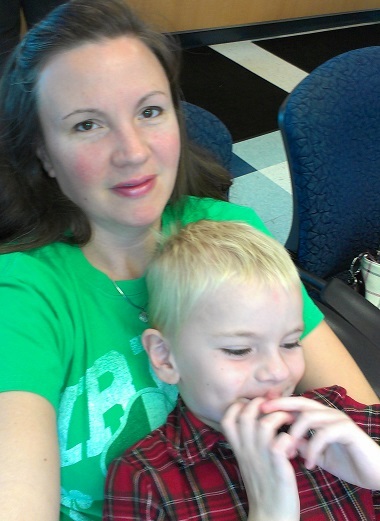 I took him back to the doctor (an urgent care center this time) and they said he has Strep Throat and an Ear Infection. Poor baby! It is so hard because he almost never gets sick! Ugh! I hate it when the sickies invade. I took Karsyn to urgent care this weekend. I was sure she had bronchitis, but it's her allergies. She is coughing something fierce! It's mostly at night, so we've all been pretty tired. Awww, I am sorry poor Lance was so sick, but he sure didn't let it slow him down from the looks of it. I love the picture of you and him together. 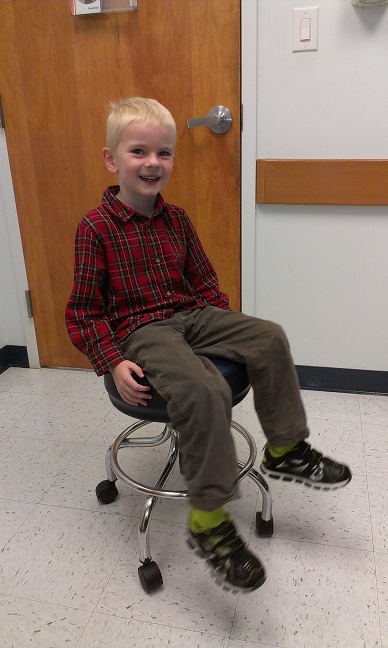 And what little boy can resist the doctor's spinning stool? Haha! Oh poor Lance. I hope he's feeling better now. We've been fighting family sickness for over a month now so I feel your pain. Thankfully, I think we're coming through it now but it's been a rough month.